Get more from your CIZE base kit! 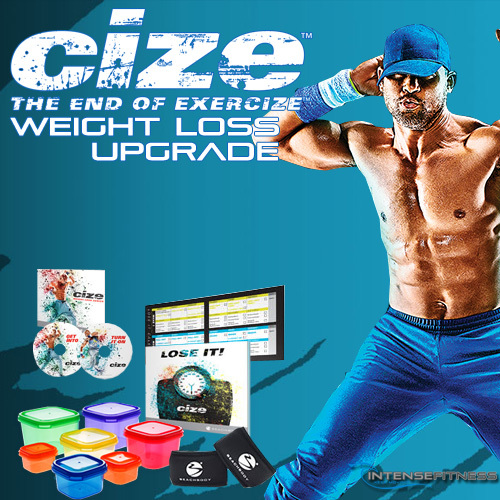 The CIZE Weight Loss Upgrade Package contains 2 More Accelerated Dance Courses, Weighted Wristbands, Deluxe Calendar, Lose It Guide and 7 Piece Container Set. That’s exactly what you’ll do in this fast paced dance course where you learn a routine that’ll have your heart racing and your body incinerating calories. Dance your heart out and break a sweat to the song He Ain’t With Me Now, originally recorded by RichGirl. Challenge yourself to yet another intense dance combo that you can perform to Wild, originally recorded by Jessie J. Wear these comfortable and stylin’ weighted wristbands while you bust out the hottest dance routines. They’ll help you tone your whole body by adding resistance to your movements. So you can burn even more calories in the same amount of time! This calendar incorporates the faster paced, sweatier routines along with the basic dance routines to help you lose the most weight possible in 30 days. Get Shaun’s best weight loss tips to shed that extra fat ASAP! This CIZE Weight Loss Series also includes seven color coded containers that take the guesswork out of eating healthy. Designed to work with your CIZE EAT UP! Meal Plan, the containers deliver the right portions of food every time.